Spring Shoe Deals - Nautical Flats | Jenny. Maker. I am an endless sucker for nautical, particularly each year when beach and boating season approaches. This year, being no different, I hoped to find a cute navy and white striped ballet flat. Whilst Googling, I came across a deal that I had to share. Brooks Brothers has a canvas and leather nautical flat for only $29.60, down from $148! 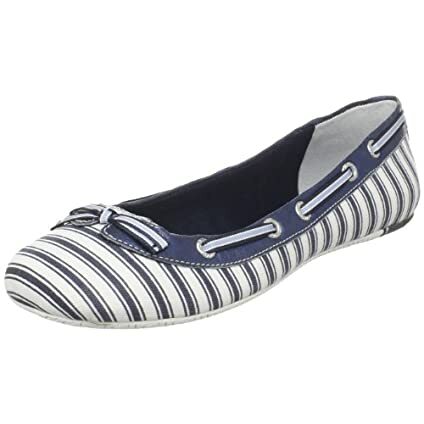 Additionally, Endless offers a Sperry Top-Sider navy/white flat, in a wider range of sizes, for $36, down from $74.95. If you know of any great shoe deals, please share! After all, we have to have shoes to compliment all of our pretty self-stitched spring clothes!. I'd especially like to find a cute, comfortable flat for sightseeing (wouldn't we all?). Very cute! Thanks for sharing. I love the sperry's. Happy to share! I expect the Sperry's are comfortable too. The pairs I have are (different styles). I live in high heals and am always on the lookout for a cute pair of flats, 'cause when I'm not in heals I'm wearing athletic shoes - which is just not pretty. I used to live in heels too! I only wore flats to the office on casual Fridays. I certainly can't blame you for wearing athletic shoes when the heels come off - they're so much more comfortable! I'll pass along any cute, comfortable flats I come across. I'm determined to find some this year! It seems we're not the only ones who think so! They're going quickly too!